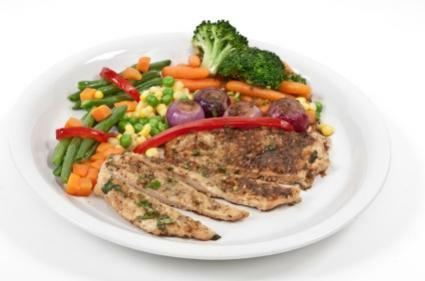 Grilled chicken marinades can turn a plain, boring chicken breast into a gourmet meal. Not only do the marinades add flavor to chicken, but they can also keep chicken breast - which is quite low in fat - moist and juicy. With the variety of flavor profiles available for grilled chicken marinades, it's easy to find one to suit your tastes and mood. Marinating isn't just for chicken breasts. You can marinate any piece of chicken, or even a whole chicken. Marinating adds both flavor and moisture to the chicken. Since grilling is a form of dry heat cooking, marinating chicken is especially important to keep your poultry from drying out. Marinating chicken should always be done in the refrigerator. Typically, chicken takes about an hour to soak up the flavors in a marinade. To marinate the chicken, toss the chicken together in a bowl or ziplock bag, tightly seal, and place in the refrigerator for about 60 minutes. Skinless chicken will absorb marinade more quickly than skin on chicken will. If you are marinating a piece of chicken with the skin on or marinating a whole chicken, leave it in the marinade for about two hours before cooking. Never reuse marinade. Once you have marinated your chicken, discard the marinade. Reusing marinades can lead to food-borne illnesses. There are a number of high quality pre-made grilled chicken marinades that you can buy if you don't want to make your own. Even an oil/acid type of salad dressing can be used as a marinade if you so desire. Pre-made chicken marinades typically come in one of two forms - either they come in a bottle, premixed and ready to go or they come in a foil packet, to be mixed with some kind of liquid. You can even use a chicken rub (found in the spice section of your local grocery store) mixed in with some oil and vinegar as a marinade for the chicken. The great thing about chicken marinades is that it is simple to make your own. You don't even need to follow a recipe in order to make a great marinade. Making a marinade is a matter of making a liquid base and then adding herbs, spices and other flavors to complete your marinade. The ideal marinade for chicken has a liquid base that is half vegetable oil and half acidic liquid such as vinegar or citrus juice. For instance, you might make a marinade base that is half lite olive oil and half lemon juice, or half canola oil and half red wine vinegar. With the variety of oils, citrus juices and flavored vinegars available, there are a large number of variations just on the liquid base of your marinade. Once you have your liquid base, then it is time to mix in your herbs and spices. Sea salt and fresh cracked black pepper are always a good start. From there, you can use a variety of fresh and dried herbs and spices to impart the flavors you want in your chicken. Below are just a few marinade recipes to get you started. Use your creativity and vary them, or create your own entirely. Whisk together 1/2 cup of lite olive oil, 1/2 cup of red wine vinegar, four cloves of finely minced garlic, 1/4 teaspoon of salt, a few grinds of fresh cracked black pepper, two tablespoons of chopped fresh parsley and two tablespoons of chopped fresh basil. Whisk together 1/4 cup of canola oil, 1/4 cup of fresh squeezed lime juice, 1/4 teaspoon of salt, a few grinds of fresh cracked black pepper, two cloves of finely minced garlic, two tablespoons of chopped, fresh cilantro, one finely minced shallot and 1/4 teaspoon of dried chipotle chile. In a small bowl, whisk together 1/4 cup of olive oil, 1/4 cup of red wine vinegar, 1/4 teaspoon of salt, a few grinds of fresh cracked black pepper, four cloves of finely minced garlic, one finely minced shallot, one tablespoon of fresh oregano and one tablespoon of fresh marjoram. As you can see, marinating chicken for the grill is easy. With the variety of ingredients available to make marinades, you are only limited by your imagination.